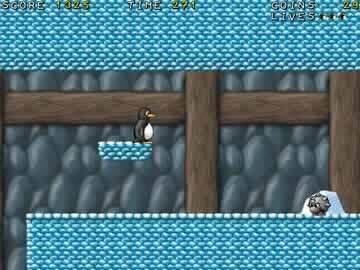 Super Tux Game - Download and Play Free Version! Jump and Run Mario Type Game With Tux the Penguin! Tux and Penny were enjoying a lovely picnic on the ice fields of Antarctica when a shadowy creature stepped out from behind an ice bush and after a bright flash left Tux unconscious. When he awakens, Penny is gone and only a threatening note remains. Apparently Tux's mortal enemy, Nolok, has kidnapped his true love and whisked her away to his imposing fortress. Help this intrepid penguin as he fights Nolok's minions and travels across the vast ice fields in search of his darling Penny. With gameplay similar to the classic Super Mario Bros., Super Tux presents an enjoyable gaming experience that gamers of any age can savor. The gameplay itself is reminiscent of the classic side-scrollers of old. You control Tux with the arrow keys as you have him negotiate the various levels, avoiding the wide assortment of minions arrayed against him. Collect snowballs to double Tux's size or grab the red colored flowers to grant him some fire wielding abilities. Jump on your enemies' heads to stomp them from the screen and collect coins in order to gain more points, or even an extra life. Find plenty of other Mario similarities such as hidden blocks, destroyable crates, the ability to run over small gaps by holding down 'run' and magic stars which make you temporarily invincible. The similarities found in Super Tux with the classic games of old provide an entertaining gaming experience. Fans new and old can quickly pick up this title and be running and jumping in seconds as they work to complete all 26 levels. Experience some moments of nostalgia as you fight your way to the villain's castle and try to save your beloved with this amusing quest. If you like side-scrolling platformers, then download Super Tux and begin the adventure today! Take a peak at some of the gameplay that is in store for you in Super Tux.